It is the responsibility of all state governments to design and implement developmental projects for common people. But the elaborate stature of these schemes makes the implementation rather tough. If government authorities don’t get information about the disparities, they will not be able to make necessary changes. 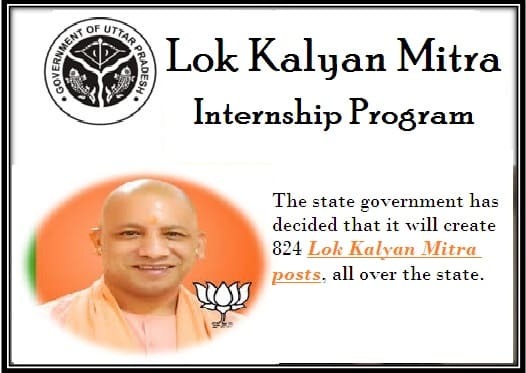 Thus, UP government has created Lok Kalyan Mitra internship program. The state authority will appoint educated and trained individuals to keep track of the scheme implementations. These Lok Kalyan Mitras will educate people at block levels about developmental schemes of the Yogi government. The Uttar Pradesh authority has announced that it will be the task of the Lok Kalyan Mitras to collect information about the implementation of all state and central schemes. It will be the responsibility to bridge the information gap between the common people and the government departments. With technological tools at their disposal, the 822 block-level and 2 state-level Lok Kalyan Mitras will form a platform that will help people to register their feedbacks. Apart from this, these individuals will also help to popularize all state projects. They will inform people about their rights and benefits they can attain. With the help of these professionals, UP government wants to reach out to more people, make them aware and pave the path for better implementation of all developmental projects. The Uttar Pradesh state government will offer Rs. 25,000 to all Lok Kalyan Mitras who will operate at block levels. Apart from this, each person will also attain Rs. 5000 as allowance. This takes their monthly salary to Rs. 30,000. On the other hand, the two state level Lok Kalyan Mitras will receive Rs. 30,000. In addition to this, they will also attain Rs. 5000. Overall, each state level Lok Kalyan Mitra will receive Rs. 35,000.